Our new son-in-law eats a healthy diet. I did find that it is relatively easy to cook for him although the first time, I made him a meal, it was the most simple meal, I have ever made. I figured, I could not go wrong with plain quinoa, plain chicken and plain salad. It was boring, as well, and he likes good food. As time has gone by, I discovered, it is not that much of a challenge to make food that tastes good and that will fit his needs and wants. So when I came across the recipe from Meals the Heal, I knew it would be a great success. 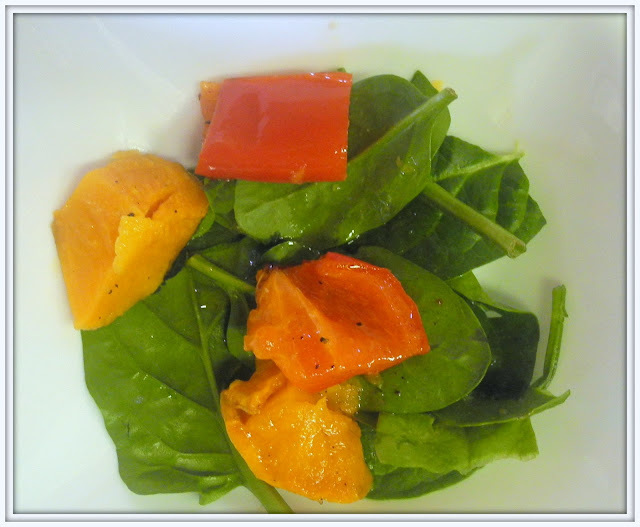 2 large red bell peppers, cut into 1" pieces "
In a large roasting pan, combine the oil, salt, and black pepper. Add the sweet potatoes and bell peppers and toss to coat well. Roast, stirring occasionally, for 40 minutes, or until the potatoes are tender. Remove from the oven and stir in the vinegar. Place the spinach in a large serving bowl. Add the potato mixture and toss to coat well. Serve immediately. This sounds too healthy to be good. But I like everything about it. We are hosting a new party at Tumbleweed Contessa. I'd love it if you would bring this over. Grab a button and come back each Monday to see what everybody has done over the weekend.